Countless Christians battle intimidation, which is camouflaged and subtle. Many feel the effects--depression, confusion, lack of faith--without knowing its root. Bevere guides readers below the surface to see the roots of intimidation. Readers will understand why it is hard to say no, why the fear confrontation and avoid conflict, and why they focus on pleasing others. 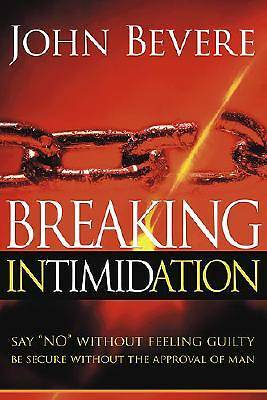 Readers will learn to identify intimidation and know how to break its hold. Bevere explains how the fear of God keeps us from a life of ungodliness and produces confidence and boldness. Bevere advises, "Walk in your own God-given confidence and boldness. Bevere advises, "Walk in your own God-given authority, or someone else will take it from you and use it against you."